Monday December 21st 1908 I did the working in the morning and got the dinner I was busy with my Christmas work all afternoon. I dressed a chicken and folded the clothes before supper. I went over to Mrs Jones with some plum butter I had made. I ironed in the evening. Tuesday December 22 1908 I went down to the depot early and sent a package in town that was to go to Lou Reeves Simpson. I did the house work and what I could on my Christmas work. I finished the handkerchief for Ann [Hensler?]. In the evening I wrote some cards and got a package done up for Ida & Nellie. Will sold 5 head of stock to the Smith boys for [$125.00?] 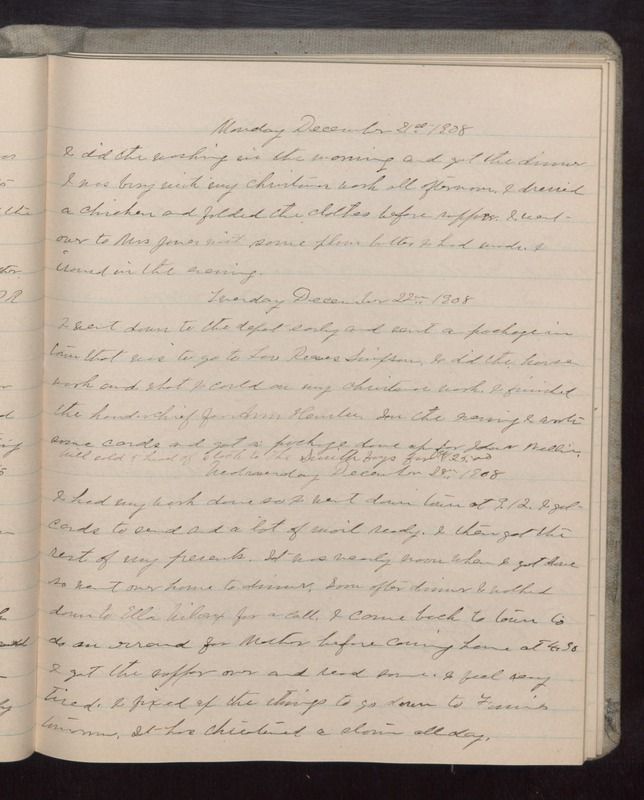 Wednesday December 23 1908 I had my work done so I went down town at 9.12. I got cards to send and a lot of mail ready. I then got the rest of my presents. It was nearly noon when I got done so went over home to dinner. Soon after dinner I walked down to Ella Wilcox for a call. I came back to town to do an errand for Mother before coming home at 4.30 I got the supper over and read some. I feel very tired. I fixed up the things to go down to Fannies tomorrow. It has threatened a storm all day.